We hope that everyone had a wonderful Halloween yesterday if you were celebrating. 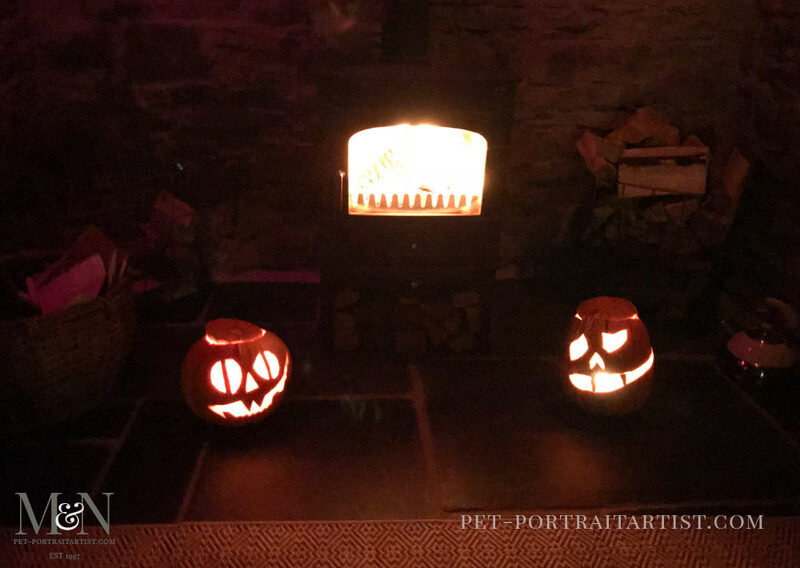 We had our very own Pet Portraits Halloween! Nicholas and I worked for most of the day on our paintings and drawings. However stopped in the afternoon to head out and purchase some sweets for any potential trick or treaters. Living quite rurally we don’t usually have many calling, apart form the little girl next door. My dad has always grown pumpkins since I can remember. Every year they take up a huge space in his vegetable patch and grow extremely well from the well manured soil! He always supplies us with the biggest and heaviest pumpkins imaginable! We gave one to the little girl next door this year and she was delighted. I always say you are never too old to have some fun. 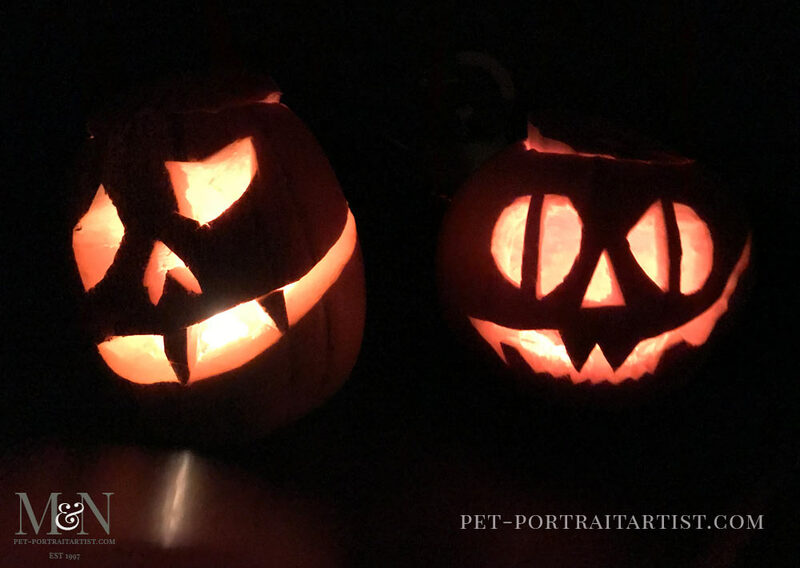 So Nicholas and myself, with Lily our dog watching of course, carved a pumpkin each. You can see photos below….can you guess who’s is who!?! We also had fun with the wifi lighting in the living room. What an opportunity to have play with Alexa and the coloured lights, making it quite spooky. You can see the fire is alight, we light it most evenings now. The clocks have changed and the autumn is well and truly here so it’s wonderful and cosy to shut the blinds and curl up in front of the fire on a cold evening.We hope that you all had a lovely evening too! Your cottage renovations are brilliant, I love to think (know) you’ll be cozy and comfortable no matter what the winter brings. Very naughty of you not to give us the phonetic pronunciation of Mwnt. I studied Irish long enough to conclude that the spellings were designed to confuse the authorities! Utterly impenetrable. Happy Samhain to you both.